August 2009 - Pebbles, Inc.
Hello,my name is Marielle Leblanc and I’m so happy to be your host this week. I have to admit that the layout I prepared for this challenge was a departure from my usual style which tends to be very bright and colorful ! I really wanted to challenge myself and the Pebbles DT to showcase the various tints and shades of the beautiful Pebbles inc. papers,chipboards,ribbons,etc. Here’s a look at the beautiful layouts made by the other members of the DT ! Liz even shared the beautiful sketch she used for this lovely PINK layout !!! Monochromatic layout using white,creams and light tans. 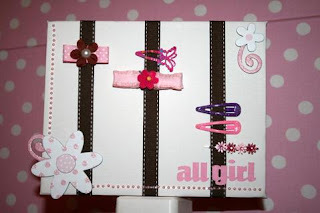 an other beautiful PINK layout and close up of the ribbon frame ! 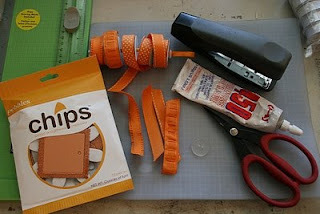 Using beautiful tints of ORANGE. Layout using Skipping Along papers ,chippies, ribbon and candy dots in PINK. 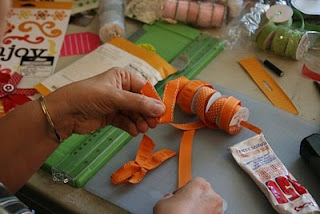 Layered Ribbon Technique day…it’s a wrap! Today is our final day of my colorful ribbon splash week. I have really enjoyed hosting the blog this week and thank you for stopping by to share with us! 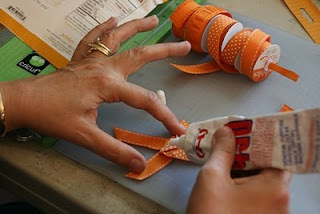 Now, just take a moment and pull out that colorful ribbon for some homemade embellishments that myself and Pebbles Inc. DT member Ginnifer Maloney thought we would share two idea palates, in order to inspire a variety of ribbon uses. I wanted to create a rainbow effect, opposite my son Gavin’s black and white photo. The contrasting cardstock really makes for a nice matting against the brightness of the ribbon. The white stitching, chipboards, and penmanship also create a sharp contrast for the photo. Enjoy! 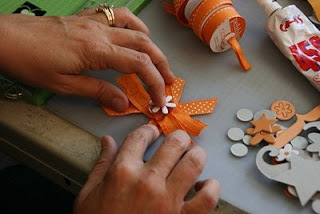 1) Gather ribbon spools and cut Approx. 3 inches of each coor/pattern. *Vary +/- the 3 inches for more graphic effect in the ribbon. 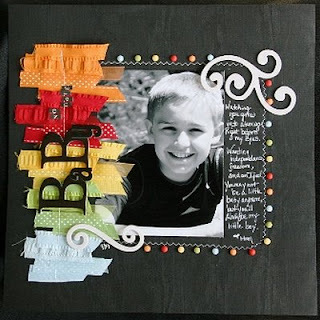 *When cutting start at top of ribbon spool and gab a sampling of each style for visual effect. *Lay on flat surface in order, for ease of putting together layout. 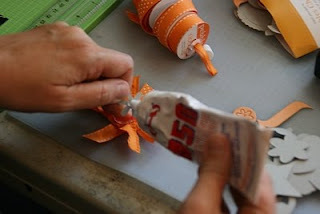 2) Starting at bottom of page, layer individual ribbon on top of each other. *Vary start and stop positions of ribbon for effect. 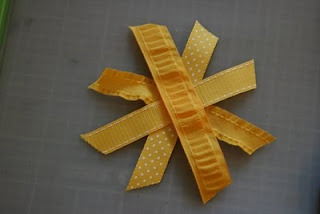 3)Carefully list page to sewing machine and sew down center of the ribbon pieces. 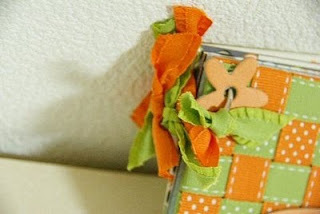 5) Sew around edges of photo in a framing form. 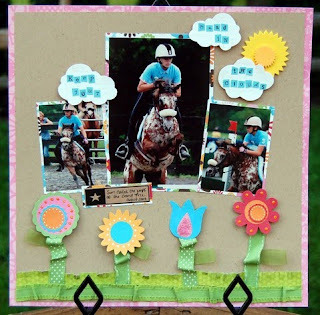 6) Add Candy Dots and chipboard accents for framing piece of photo. Your final project can take on many looks, but here is my take that you saw earlier this week. 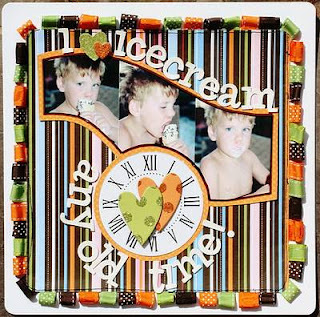 Now, there are other wonderful ways to create fun layouts with huge color splashes, take a look at this fun layout that Ginnifer Maloney created, using another ribbon flower technique. I love how Ginnifer folded her flowers under for another unique way to make the ribbon petals pop. 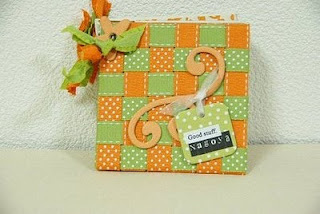 She also likes to use staples (a favorite of mine) and adhere her ribbon to her layouts with a click. 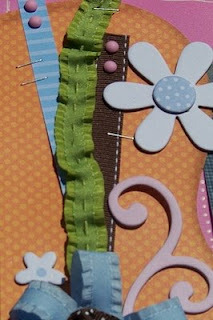 The cute stitching down the middle ribbon stem just added the perfect detailing to her sweet layout. That and the contrast of the straight ribbon stem, just highlighted how versatile of a technique that Ginnifer was able to share. 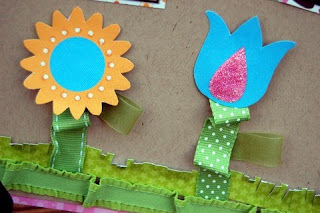 Easy, quick, and the perfect accent to an adorable floral page. The centers, too cute!!! Gathered brown ribbon, with white stitching…..absolutely perfect! I want to thank everyone again for peeking in at our colorful week this week. I hope you have enjoyed the fun and quick ways to enjoy all that luscious ribbon that I know so many of us have in our stash. What a variety of ways to use that scrumptious product. 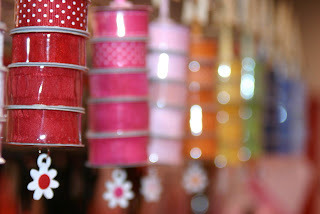 Ribbon, ribbon, and more ribbon…….inspirational “eye candy” to share today! 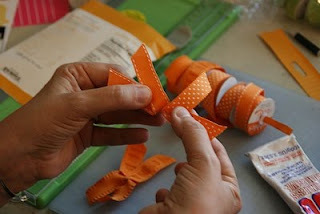 Several of our Pebbles Inc. DT members have created some additional inspirational ribbon tip projects for you today. I have really enjoyed receiving them and looking closely to see how each designer manipulated the same product. This was such a fun challenge for the week. Ribbon adds such dimension and variety. It is interesting to see how each gal has taken it to the next level. 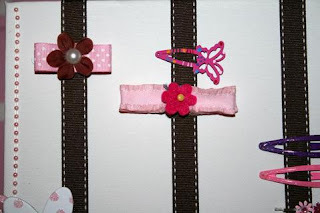 Look at this cute little hair clip holder that Sophia Allison created for her little girl. 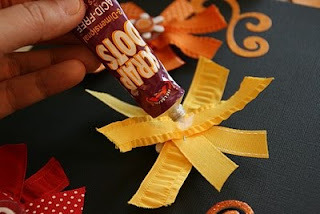 What cute and practical way to share the love of ribbon with your little one. Mimi Leinbach used her ribbon to bend and scrunch into the sweetest little flower stems and even added curled and trimmed grass, to create the entire effect. Beautiful weaving from Akiki Kuroki, creating a detailed album cover for her photos and shared memories. 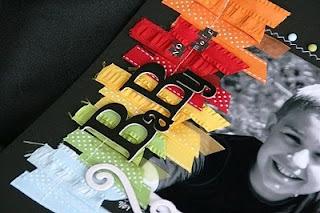 Ruffled ribbon, one of the sweetest additions to any card. 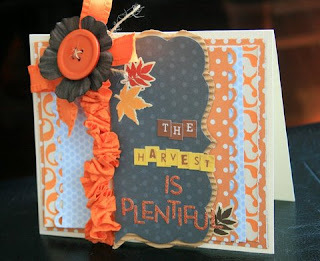 I just loved how Emiline Seet added depth to her beautiful card with all that luscious orange ribbon. So pretty! So many new tips and techniques to try, I had better go pull out my stash! Enjoy and see you tomorrow for a fun Friday! 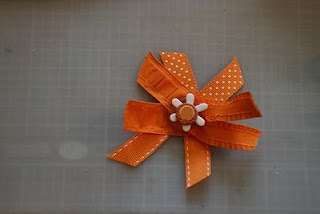 A Quick Ribbon Flower tip! More inspiration to move you through the week, more color and hopefully a quick little tip that you can creatively play with right away. I just adore flowers on my layouts, all sorts of flowers; fabric, paper, ribbon, tissue, or even lace. You name it, I think a flower has probably been created from it. This week, I created a quick layout, using a super simple ribbon technique that you finish off with a staple and a little topper of your choosing. Yes, this simple little sweetie is what I call a stapled flower. 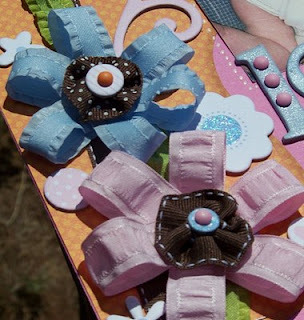 When you look closely, these little flowers are all ribbon, a touch of chipboard, and a few buttons. 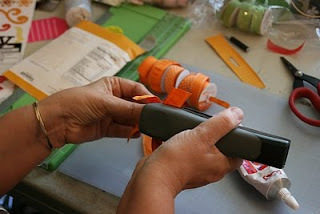 Grab yourself a stapler, some good adhesive and your ribbon and you are ready to go! Remember to continue to peek back, as we have another fun tip to share tomorrow and plenty of more creative layouts to share the rest of this week! Adhesive: Helmar 450 Stainless Adhesive and Helmar Liquid Scrapdots. Cut your ribbon and staple the contrasting pieces together in an opposite direction. 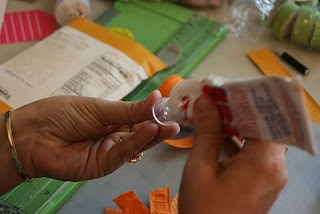 Adhere clear liquid glue to the rear of a button and add to ribbon flower. for a layered button topper. 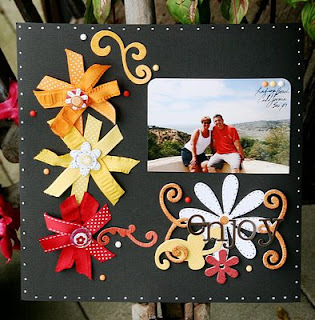 Add dimensional adhesive to rear of ribbon for added lift of your embellishment. Inspiration is found everywhere and these images are no exception! What beautiful art is out there in this world, being created everyday! I just love looking at beautiful photos on photobucket. A really fun photographer, evilpupp97, off photobucket took these inspirational photos and added an element of splash that I love to look at. I thought I would share some of them with you today. Look at the stripes on those laces, would they not make such a fun ribbon piece? Speaking of striped, I love how Susan Dupre took the striped paper and accented the edges of her layout with the rolled ribbon. The striped pattern versus the various colored ribbon rolls give such a unique color effect, it really catches the eye. I am also a huge fan of dimension and this layout really pops off the page! Circular beams, coming from a focal point……another inspiration! 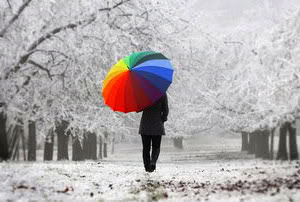 What would I give to walk through a rainy day with this type of view! 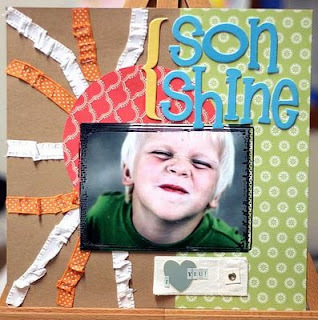 Deana Kroll also used beams coming from a circular focal point in her her adorable layout of her son. Deanna crimped her ribbon and then used staples to adhere it to the page. I love the sharp contast it gives to the fabulous photo. What beautiful colors that the ribbon accents add! Here is one of my favorites…..what does it inspire in you?